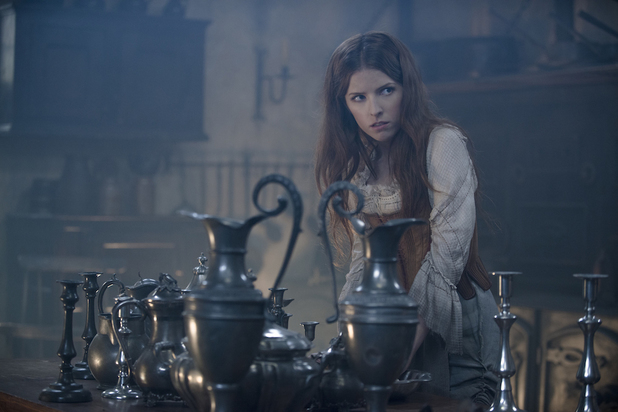 Based on the information before us, “Disney’s Into the Woods” looks like all the other contemporary re-imaginings of fairy tale worlds we’ve seen this decade. CGI beanstalks and thorn bushes break through the earth with the same crunching sound that dominates every trailer from Maleficent to Pompeii. I don’t think this means the movie has been re-conceived as an action-adventure movie (but there isn’t much to imply it’s anything else either). Meryl Streep’s Witch is the only character who gets to so something besides “I wish”, and her “go to the WOODS!” is appropriately deranged. The move seems very excited to have Chris Pine in it, but shoots Billy Magnussen as a horse-riding spec on the horizon, like he’s Marla Hooch in A League of their Own. This is a “serious trailer”, so we don’t see any glimpses of Tracey Ullman as Jack’s mother or Christine Baranski’s Step Mother (though there are still shots of both). There’s no singing either. The underscoring cleverly weaves familiar musical themes throughout, but not a sensible sixteen-bars of “Children Will Listen”. At some point they’re going to have to tell people that this is a musical…but that point may be Christmas day, 5 minutes after the movie begins. But I wonder if the Gothic nature of the trailer is more than a blatant attempt to trick people who are not interested in musical comedies into seeing a musical comedy: Perhaps it is Disney’s way of signalling to the fans riled up by Sondheim’s reports that the studio demanded the elimination of a few mature plot points that the Mouse is not afraid of the musical’s darker subject matter. Isn’t it nice to know a lot? (And a little bit not).